Review: 2014-09-06, nice and tough shots between Michelle Waterson and Yasuko Tamada: it gets three stars. The black belt in karate Michelle Waterson entered this fight with a professional mma record of 11-3-0 (82% finishing rate) but she is not ranked as she hasn’t fought since April 5, 2013 when she defeated Jessica Penne winning the Invicta FC atomweight belt (=Penne vs Waterson). Her opponent, Yasuko Tamada, has an official record of 15-8-3 (13 submission victory rate – she has never won by ko/tko) and she entered as the No.7 women’s atomweight in the world, she comes off three consecutive wins. 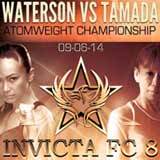 Waterson vs Tamada, main event of Invicta Fc 8, is valid for the Invicta FC atomweight title (Waterson’s first defense). Watch the video and rate this fight!